Whether you have your own set of business cards, or if you keep many business cards with you from various companies, individuals and businesses that hand them out; this cute little holder can keep them all in place. It’s a simple job for most sewing machines and you can have unlimited creativity when it comes to putting one together. 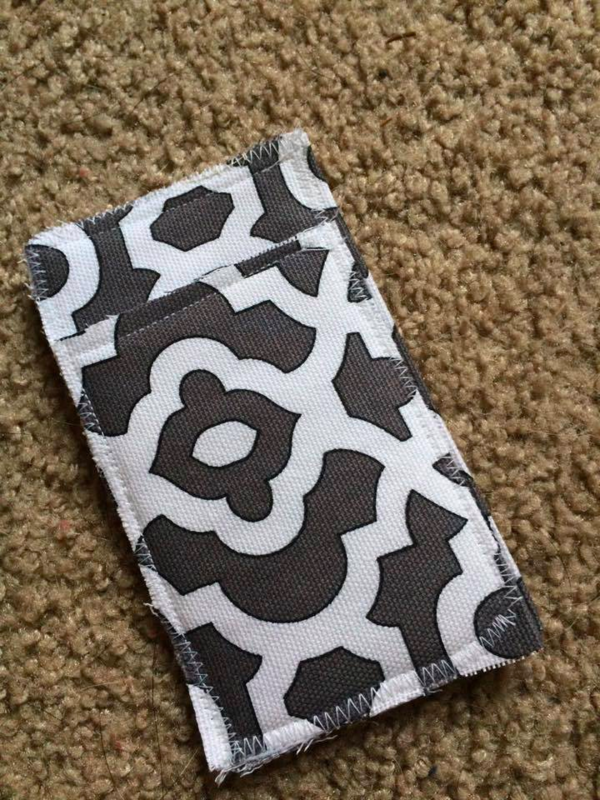 2 Pieces of 4.5″ x 6″ Fabric – You can go with two different pieces or two matching pieces, you can be the creative one in this process. Step 1: Pair one interface piece with one fabric piece and fold them over. Do the same with the other piece of interfacing and fabric. You should have two that look like this when folded over. Pin the open side in place. Step 2: Sew all the way around one of the folded pieces. You want to sew around 1/4″ in from the outside. This will give it a nice clean look when putting on the finishing touches. On the second piece, make sure to stop where you sew by cutting the sew line about a quarter of the way down. This will cut off a quarter of the top fabric, but this is what you want to cut off at the top of this piece. Once you have the shorter one and taller one done, you can then go around the outer edges using regular scissors or your pinking shears and provide a decorative border before putting the two pieces together. Take care while cutting to make sure you do not cut any of the stitches that you have done! Step 3: Pin the shorter piece to the top of the taller piece and even out the bottom. You can then pin these pieces into place and sew all the way around the holder. I used a fancier stitch since I didn’t use pinking shears for a decorative border but you can use a straight stitch or other stitch of your choice to give a unique, personal look. Trim off the excess thread and corners and now you have a pretty cool way to keep those business cards, credit cards, ID or money in place!